Being a successful business owner and mother isn’t always so easy. a tornado hit you home with every toy, game, and gadget unpacked and scattered. And you’re not the Martha-Stewart-Mom-Business-Owner type who has creative, individualized, and age-appropriate activities for each of your crumb crunchers that you cheerfully present to them each morning before you begin your work time. So does it really have to be a choice between 1) getting stuff done in a sea of unsupervised chaos or 2) not focusing on work, having an empty bank account, but a clean house and engaged family life? 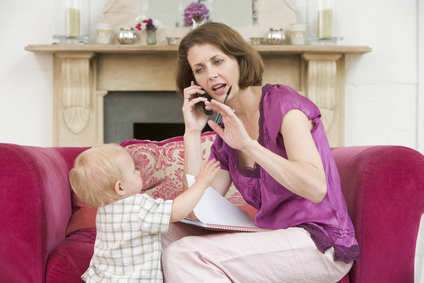 Wasn’t your concern for your kids’ well being that drove you to take the mompreneur plunge in the first place? Ladies, follow these principles and the supervision puzzle WILL come together. Job number one is to get your kids to heaven. You must base your first strategy on the truth that we are no longer living in a Catholic-friendly culture. It used to be and open door policy. Your kids could wander the neighbor and watch TV freely and safely. It worked because the world’s values fit well with your Catholic world view. Today the culture contradicts the teachings you are trying to instill in your kids. Prioritize selectively providing access to media, resources, etc. you want your kids to have, rather than cutting your kids off from the culture. (That only makes it more intriguing.) Go to the library, limit screen time until after 5 or 6pm in the day, and install Covenant Eyes on all your devices to ensure the right stuff gets in and the bad stuff stays out. This is a battle worth your time and energy. You don’t want to lose your kids’ souls while you’re upstairs banging out a blog or conversing with a client. One and done may be the trend in the NBA, but smart Catholic parents know there is power in numbers. Making babies can be a great long term mompreneur productivity strategy because your kids entertain each other. And you have the peace of mind that your values are being reinforced since they come from the same family values genetic pool. They’re happy because they have playmates, and you’re happy because you don’t always have to keep them amused. The “be fruitful and multiply” strategy can backfire if you lack a no-fighting tolerance policy. In fact, you could end up with fatal injuries as the kids duke it out when you’re distracted trying to meet a work deadline. Require your kids to work out their differences. Teach and model empathy. Discuss and elevate Christian virtues. Take a hard stand on physical aggression. Make not knowing how to get along with others totally uncool. Model good boundaries around your work time with your kids. Explain how your efforts contribute to their well-being and the good of the family. Including your kids by paying them for simple tasks, helps reduce your taxes, but also gives them a sense of ownership in your enterprise. As they see you respect yourself and your business, they, too, will show respect. You create a climate of respect for your business. It was endearing earlier today when my two youngest kids came into my home office to get some markers and supplies. Even though I wasn’t on the phone or listening to anything, they were both whispering so as not to interrupt me. The limiting belief that you really can’t be both a great wife and mother and a successful mom business owner, will crush you under its weight. Being a successful business owner and mother entails finding the right ways to supervise your kids. Believing you can be productive and attentive to what is most important tops all the suggestions listed above because you tap into your own creativity and divine inspiration to find ways to get it done. The Catholic Mompreneur’s Biz and Life Tip: Make notes and learn from your victories and set backs in fulfilling both roles of your vocation as a mother and a mompreneur.